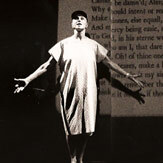 The Wisdom of “Wit” is Megan Cole’s dramatized lecture of Margaret Edson’s Pulitzer Prize-winning play “Wit” for which Ms. Cole played the leading role in the original production at the South Coast Repertory in 1995, as well as in subsequent productions in Seattle, Houston and Austin. “Wit” is a sardonic, funny, and heart-wrenching exploration of the beauty of simplicity and the puzzle of our irrevocable fate, as seen through the eyes of a 50-year-old professor of English Literature who has been diagnosed with ovarian cancer. 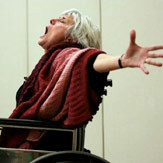 In The Wisdom of “Wit” - which Ms. Cole first developed in 2001 and has shared nationwide ever since - Megan leads the audience through the play’s gripping story, alternately acting every character and interpreting the play’s perspectives on im-portant end-of-life issues. 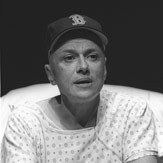 Because Megan worked directly with the playwright during the premiere production, she is able to convey the playwright’s views in an entirely unique and inform-ative way. This piece has been approved and authorized by Ms. Edson’s publisher and agent, as well as by Ms. Edson herself. The Wisdom of “Wit” is intended for educational purposes in medical schools, healthcare facilities, and all organizations whose goal is the care and well being of patients and those who love them. The piece runs 55 minutes and is best followed by a 30-minute discussion, for a total presentation time of 85 minutes. Target audiences are physicians, nurses, all healthcare staff, social workers, chaplains, hospice workers, students, and private caregivers. Bookings are typically made at least one month in advance, with exceptions possible subject to Ms. Cole’s schedule. Fees include coach airfare, ground transportation, hotel lodging, meals, and a honorarium. Ms. Cole also encourages the organization to book one of her workshops to continue the conversation and learning experience with issues of Compassionate Communication. The Wisdom of “Wit” has been presented at over forty teaching venues including John Hopkins University School of Medicine, M. D. Anderson Cancer Center, Mayo Clinic, and Georgetown University Medical Center. Here is a detailed list of previous venues. For further information, and to book The Wisdom of "Wit" please visit the Contact page. Stanley J. Reiser, MD, MPA, Ph.D.